I have always heard wonderful things about Roti Chai but have never visited, however I was recently invited to come and sample the delights of Rohit Chugh’s (founder of Roti Chai) Chai Ki. 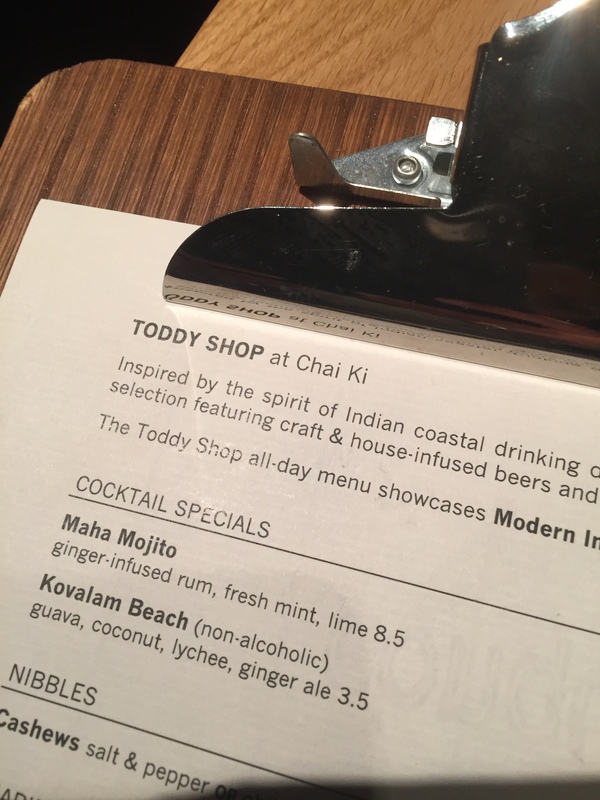 Rohit has opened the Toddy Shop at Crossrail Place in Canary Wharf. 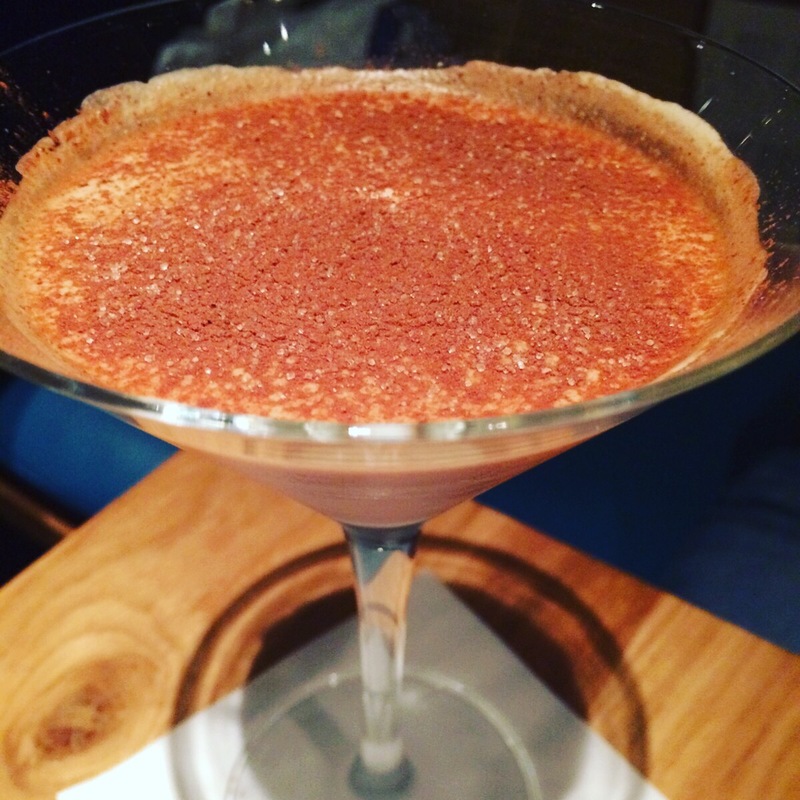 Inspired by the coastal drinking dens of Southern India, infamous for their Palm Toddy and spicy snacks. 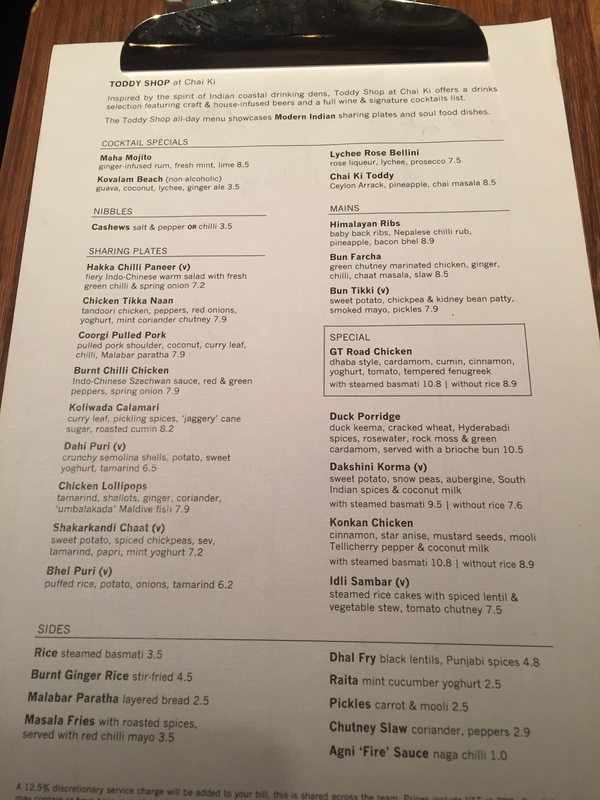 Toddy Shop is open from 7am until late serving up spicy Indian soul food alongside cocktails, craft ales and house infused beer. There is also the ‘fine-dining’ section of the eatery too; we chose the street food area for our meal that night. We arrived on a busy Friday night around 7.30pm after being a tiny bit lost as our Google Maps had taken us nearby but not quite to the exact restaurant location. We were greeted by the friendly team and shown to a nice table towards the back of the restaurant. I had been accompanied on the night by my friend Urvashi (check out her blog!) and we started with a couple of cocktails. 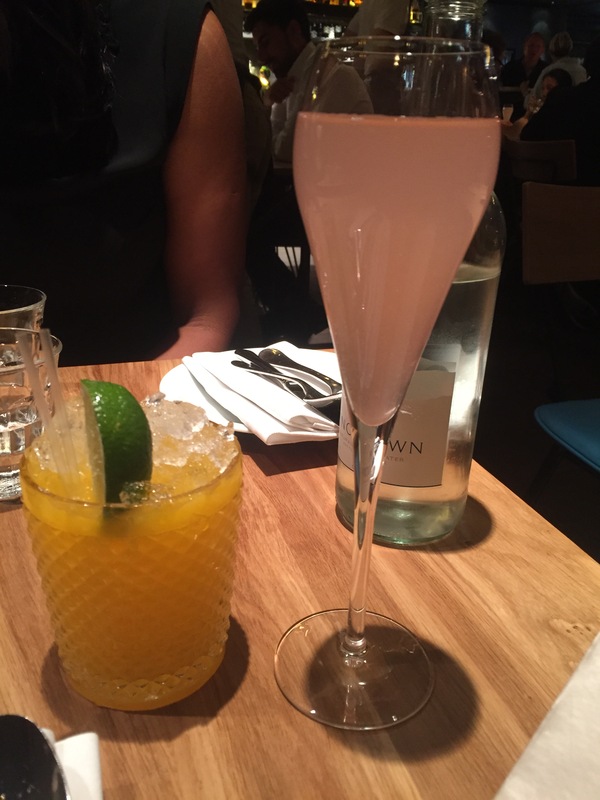 I had the lychee rose Bellini and Ush had the mango caiprinha. Both were nice but I preferred the lychee/rose martini at ping pong but none the less the cocktail was light and refreshing and perhaps should be a martini rather than a fizzy cocktail. The mango cocktail was really lush and Ush said it reminded her of ‘rass’ (Indian mango dessert) and wasn’t too strong – the perfect drink to start the meal off with. 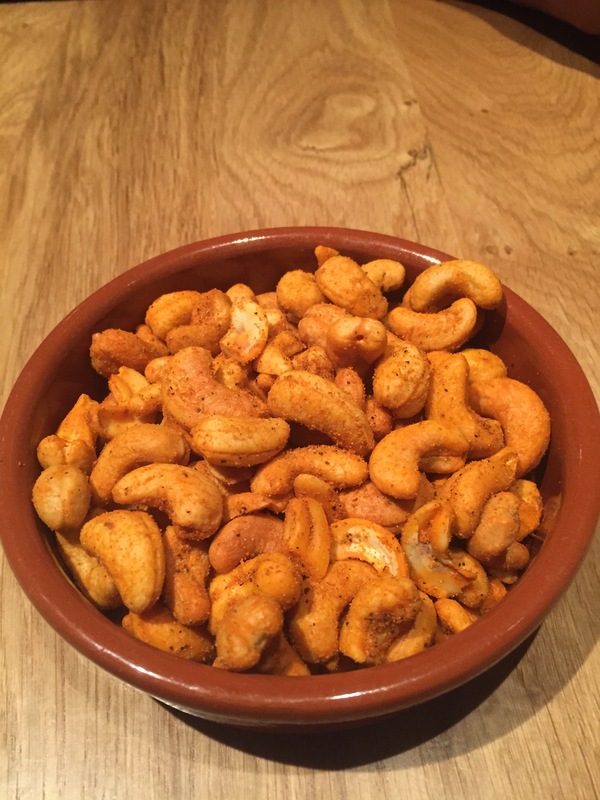 Firstly, perfectly accompanying our cocktails were the Chilli Cashews – they had a spicy aftertaste, were tangy, lemony, moreish, crunchy, left a tingle on the tongue. 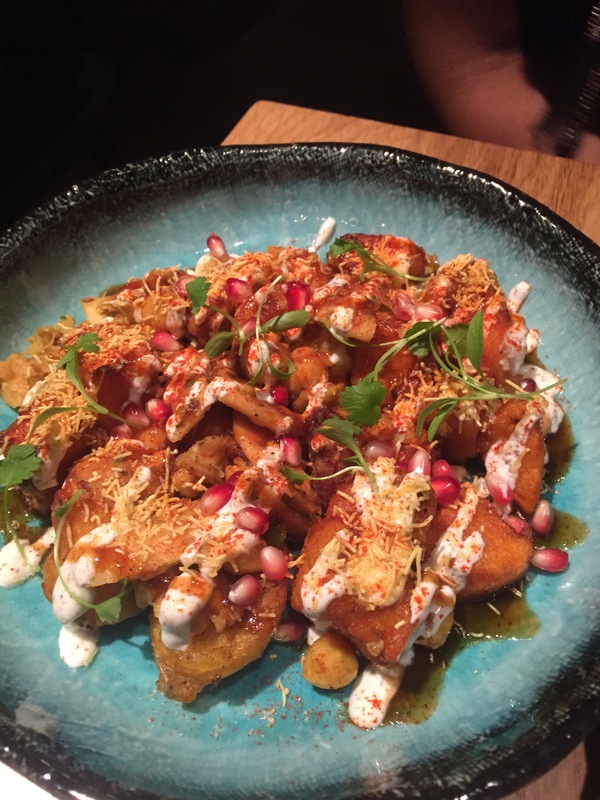 The shakahandi chaat was a traditional chaat but made with the trendy and different sweet potato, this was nice, light and fresh with pomegranate added for a fruity touch, it had nice masala flavours but could have used a touch more yoghurt. 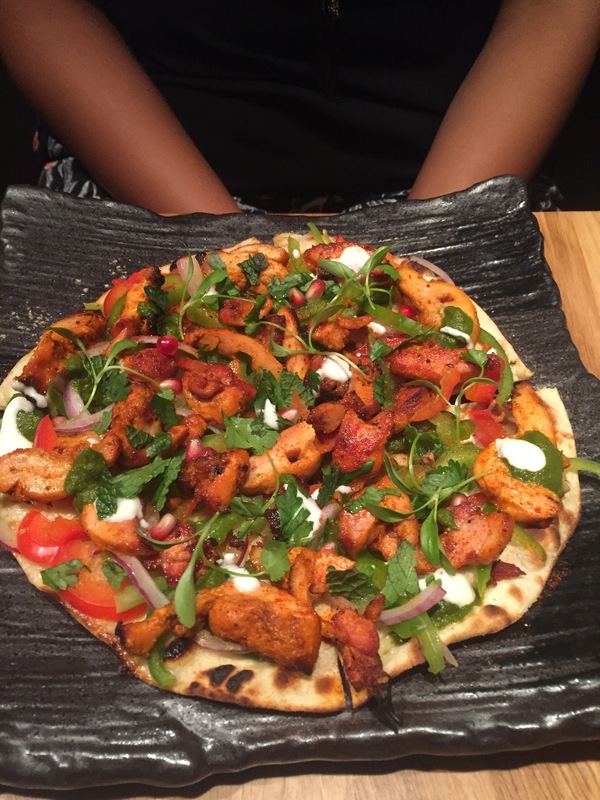 The chicken tikka naan was a chicken tikka pizza topping like concoction but served on a light, thin, soft but crispy naan. 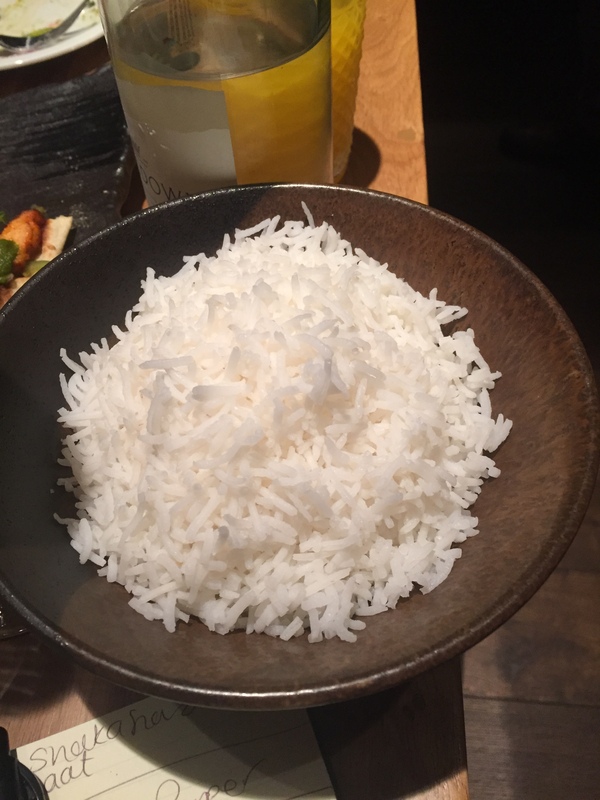 The flavours were delicate and not over-powering. With a sprinkling of pomegranate. 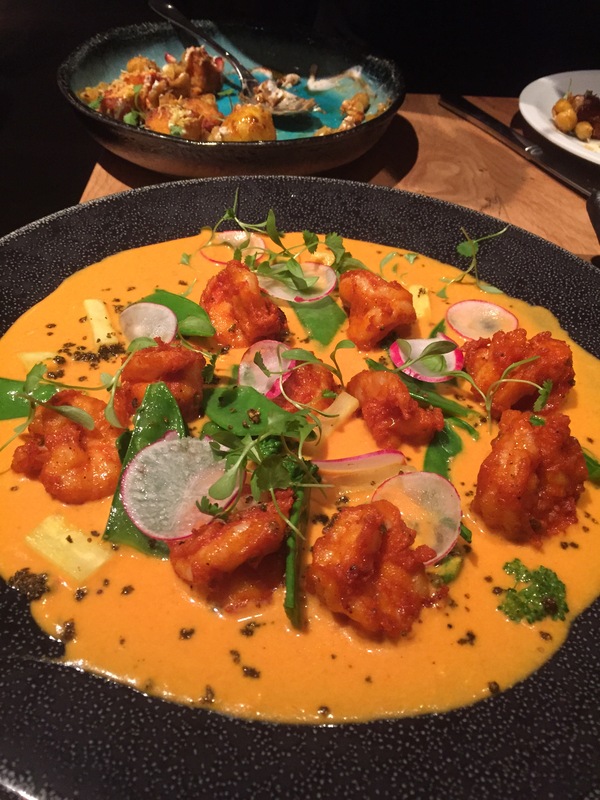 Our favourite dish at Chai Ki was a special on the menu that we ordered – the coconut prawns, this dish was a delight to look at as much as to eat. It is one of those dishes that actually transports you into a different world. We actually smelt the fragrance of the dish before seeing it. The fried prawns were served in a tomatoey, coconutty sauce and the prawns themselves were huge, succulent and tender. The sauce contained veggies such as broccoli, beans and radish. The dish was a mild delight but so flavoursome (my perfect combo as I can’t anything too spicy!) this is dish that definitely needs to be on the permanent menu. The last thing we ate was an impulse order and boy are we glad we ordered it. A fried calamari dish was a treat for seafood lovers! The best calamari I ever had and it was tough to choose between this and the prawns as the standout dish. 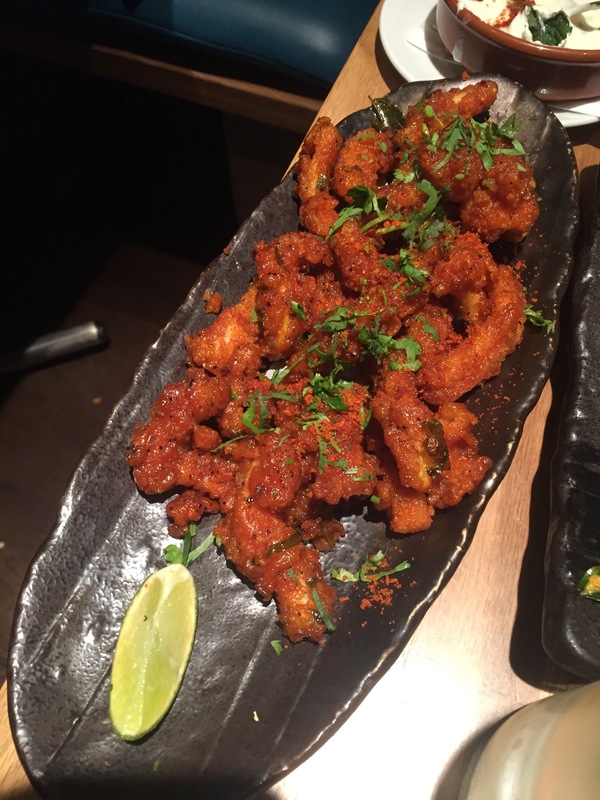 The calamari were tangy, spicy, flavoursome, yummy, more-ish – I could go on and on describing this dish so just go and try it for yourself! On the side we had some tasty masala fries served with a tangy dip, raita, fluffy rice and also a chocolate orange martini. 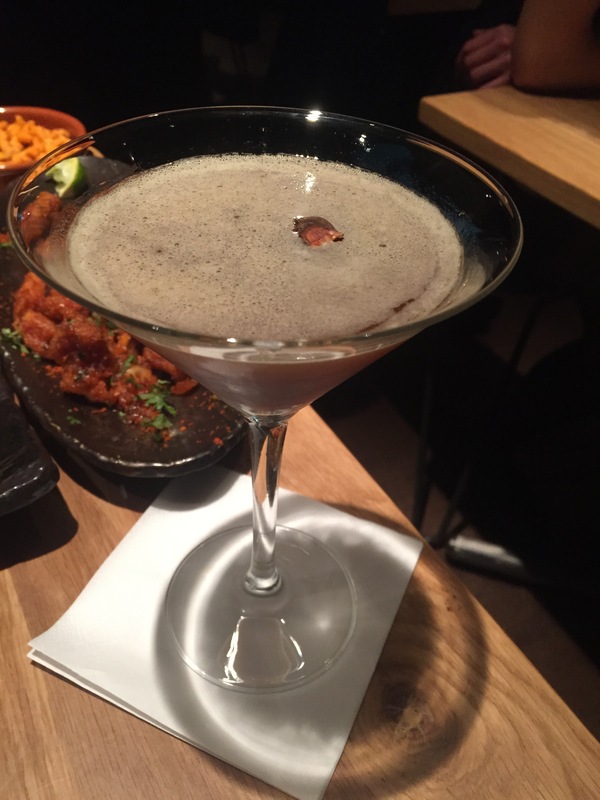 By that time we were so stuffed that we didn’t have dessert however I did order a chocolate martini that was recommended by the waitress, which was the perfect ‘mini sweet-treat’ to end the meal. We loved the fact that it had a really mixed crown, young people, older people and a mix of cultures. The vibe was really cool, trendy and funky. It almost had a very New York scene about it with the décor and ambient lighting. Overall, we had an absolutely brilliant evening at chai Ki and thank them so much for the invitation. It was the perfect Friday night and I look forward to visiting again, and again, and again (and well, you get the drift).